Award-winning author/illustrator of many books for children, Mary Wallace has a particular interest in the north. Using the word “inuksuk” as inspiration, she has created another artistic celebration of the arctic and the traditional life of the people who live there. 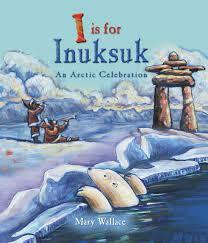 In this latest book, each letter of the word stands for another Inuktitut word: “I is for Inuksuk, the stone messenger that stands at the top of the world; N is for Nanuq, the powerful polar bear of the North; U is for Umiaq, the family’s summer sea boat; K is for Kamik, a warm waterproof boot made from seal and caribou skin; S is for Siku, the Arctic sea ice that changes with the seasons; U is for Umimmat, the shaggy muskoxen that share the tundra with other wildlife; K is for Kunik, a soft kiss that says we’re family.” Each word chosen for the acrostic poem is used as a springboard to related information about life in the north, with additional illustrations and short text to add depth to the unifying poem. The Inuktitut symbols and pronunciation for each word are provided, as well as a key to some of the different inuksuit used by the Inuit to guide the people or to mark a particular place.